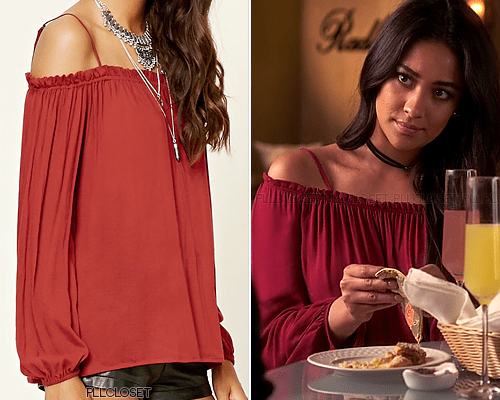 I loved this off the shoulder top for Emily. It’s super effortless and I love the choker and loose waves giving an easygoing summer vibe. And this top is super affordable too. 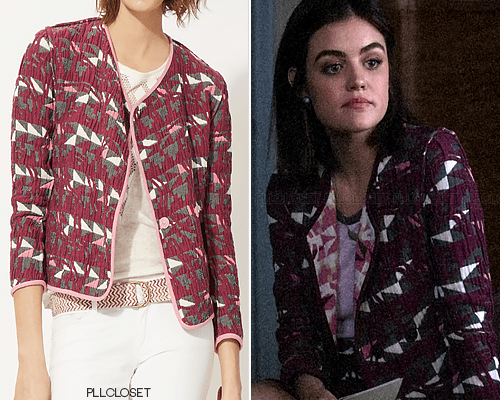 This Topshop jacket is super pretty for Aria. I love how architectural this jacket is with its boxy structure. 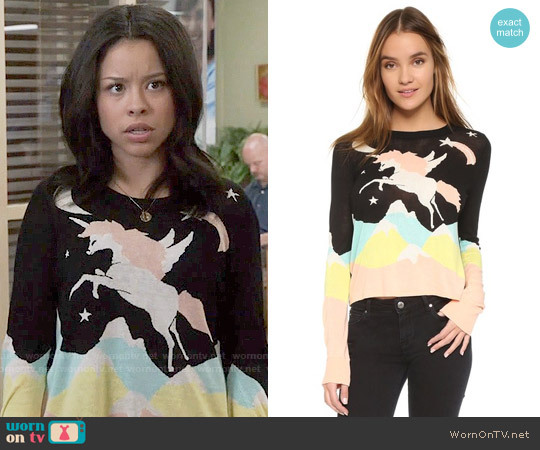 Yvonne wore a super low key sweater, and I love how casual and cute it is. The sheer front has such a delicate scenery pattern, which I like a lot. 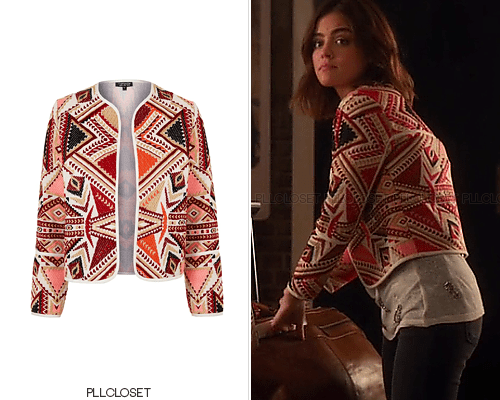 This one piece jumper is very Spencer. 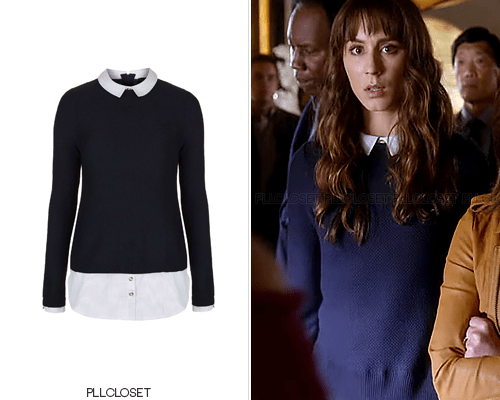 It’s classic, simple and Troian always rocks these types of preppy looks. 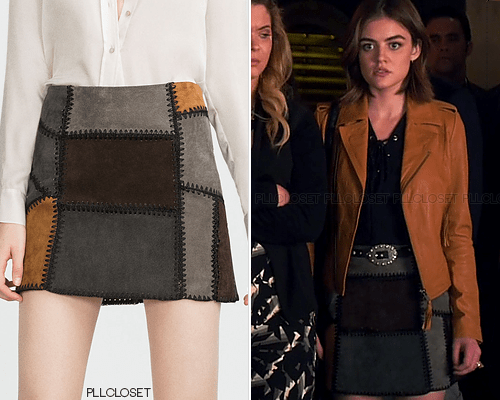 Aria is known for her main staple, which are leather jackets, but she opts for an interesting Zara skirt. I love the patchwork with the different muted colors. 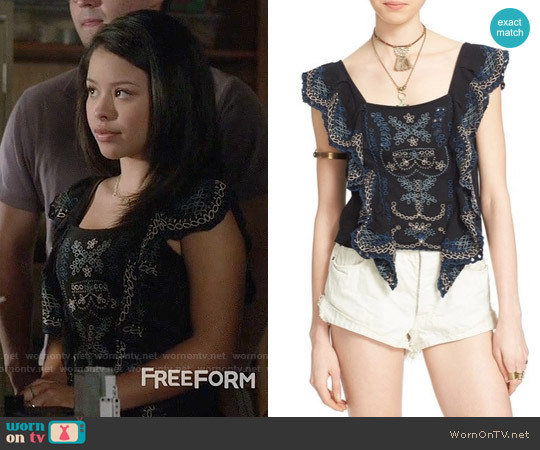 Hanna surprised me with this textured top. 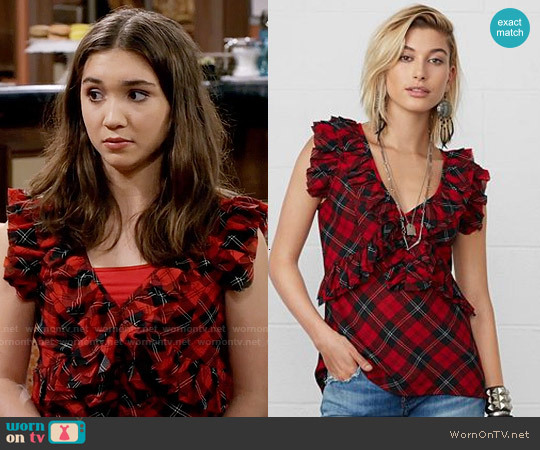 This top has a lot going on with the flowers and the gingham print and the ruffles, but Hanna pairs it with a classic jacket. It made for a fun outfit with a sharp look. 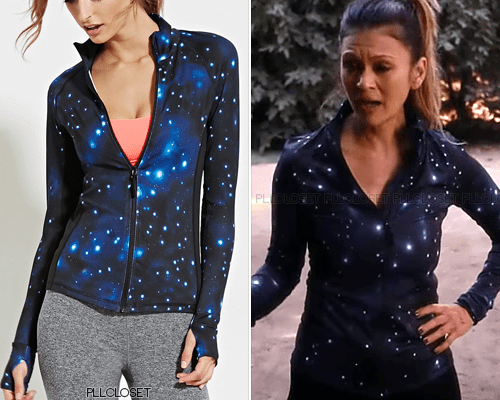 So when Emily and Pam were on their run, I noticed how cute this jacket was. It’s sold out, but who knew Forever 21 had such great affordable athletic wear. 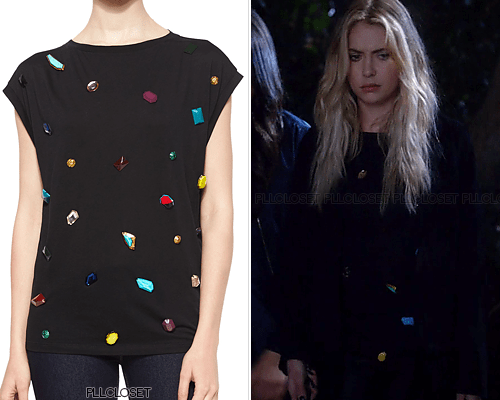 This jeweled top is super pretty. I love how random the colors and shapes are because the top is so simple. It really works here. 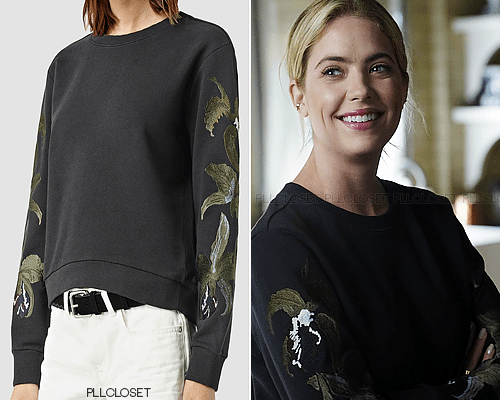 Thanks to PLL Closet on Tumblr for the photos and details on the clothing from the episode. 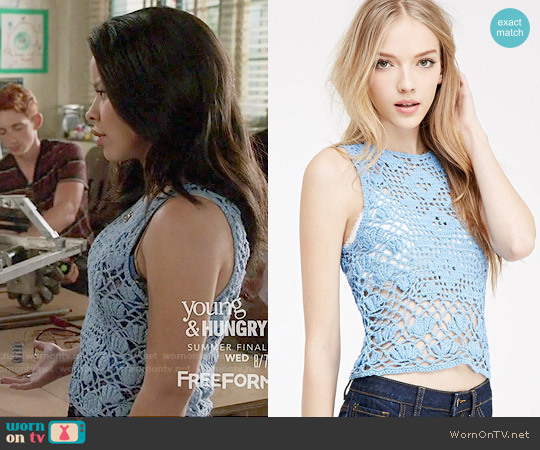 Mariana’s blue lace top was super pretty and I love how soft the color looks on her. 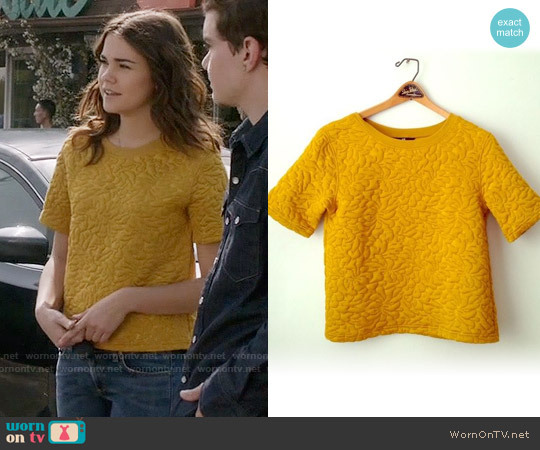 Callie wore a similar top to this earlier this season, but I really like how she wore her hair up this time. 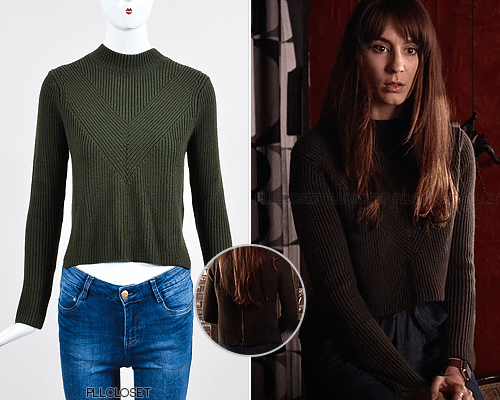 Sandro ‘Chunky Knit Zip Back Cropped Sweater’ – $65.00–I loved this Sandro crop top from Spencer. It was very nicely paired with wide legged trousers from Zara. I love how it’s ribbed inward and that it was loosely worn. 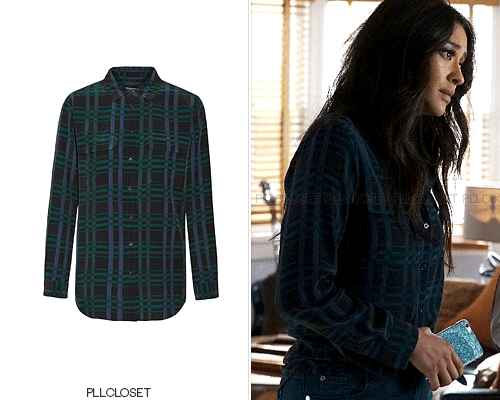 Levi’s ‘Striped Roll-Tab Shirt’ – $34.99–I was loving Emily’s style in this episode. 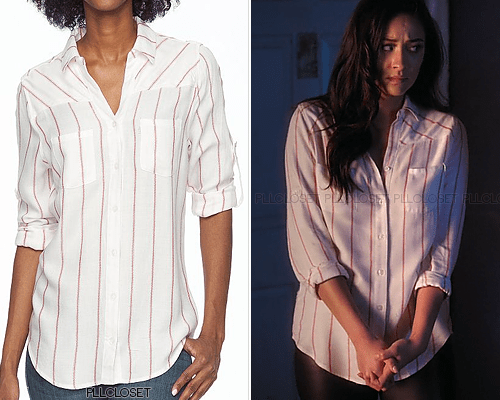 This slouchy pin striped shirt looked comfy and also a little edgy with Emily’s loose waves and leather pants. 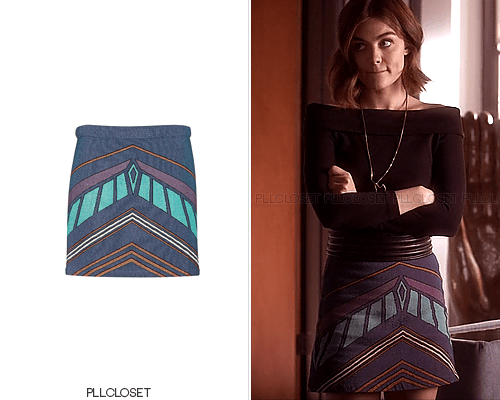 Topshop ‘Chevron Print Mini Skirt’ – no longer available– Aria looked incredible in her Topshop skirt and her off the shoulder top. 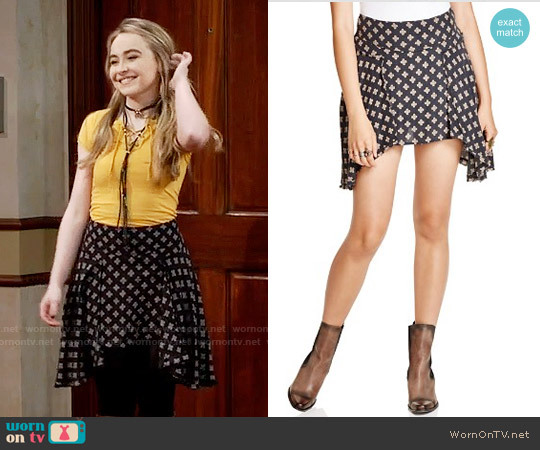 It was perfectly worn with her long necklace. She really nailed the sleek look for this episode. 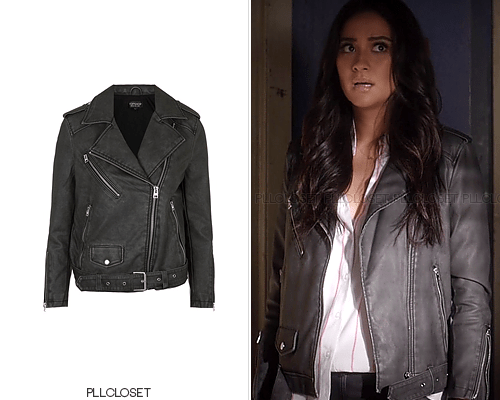 Topshop ‘Oversized Biker Jacket’ – $110.00– This was my favorite piece from the episode because I’ve actually been looking for a leather jacket like this one. 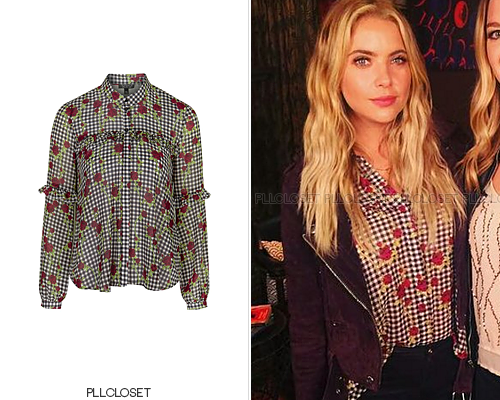 She wore it with her cute button down for a classic look. 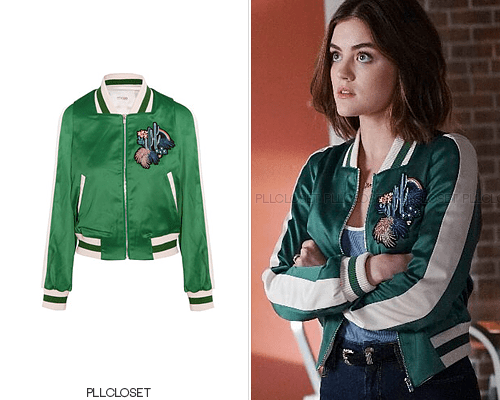 And a huge thanks to PLL Closet for providing the photos and the awesome work she does finding the details for the clothes.